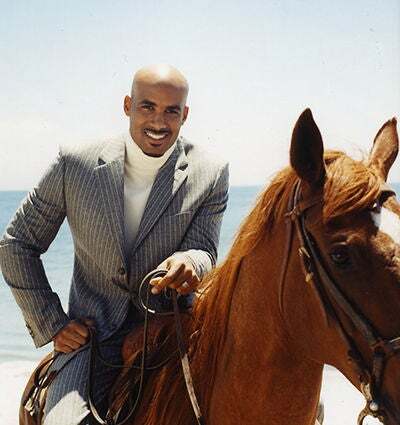 Boris Kodjoe enjoys his career as one of Hollywood’s hottest actors. Boris Kodjoe enjoys his career as one of Hollywood’s hottest actors, but being a loving husband and doting father is what matters most, he says. “I’m living a dream and I am blessed beyond belief,” he says. “For me, there’s nothing but joy and I let it show as much as I can." Power couple Kodjoe and Nicole Ari Parker arrive in style at his Atlanta birthday party in March 2008. Kodjoe cuddles up with daughter Sophie, then 2, and son Nicolas, then 7 months, for ESSENCE’s Father’s Day tribute in 2007. “My wife and I had to choose life; we had to choose our kids and each other first. Everything else is secondary to what your family gives you." In “All About Us,” Kodjoe stars alongside Ruby Dee, center, and Ryan Michelle Bathe. The movie centers on a filmmaking couple that is in search of their next big project after reaching a dead end in Hollywood. Kodjoe’s character in “All About Me” gets an unexpected surprise while holding his baby, as on-screen wife Bathé tries to assist. The couple keeps the passion alive on film, though Kodjoe admits it’s not as steamy on set. “It’s so not intimate because it’s very orchestrated and you have so many folks shouting and telling you how to hold your head, open your mouth and so forth,” he shares.